Screens and More feature “PHIFER” fabric in our sunscreens which provide you with maximum solar control, up to 90%, at a very reasonable cost. Sunscreens reduce the heat on the inside of your windows or patio, saving you money on your utility bill. The screens also provide daytime privacy, reduce glare, serve as insect screens and provide ultra violet (UV) protection for your furniture and carpet. Many color and sizes in frame and fabric are offered and in stock. 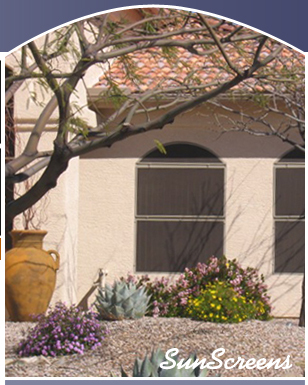 Built in our Tucson shop, same location since 1995, installed by bonded and insured employee’s the screens are easy to remove for window cleaning. Sunscreen fabric manufactured by “Phifer” in the USA comes with a 10 year warranty. We are a value leader and customer service is the definition of Screens and More. 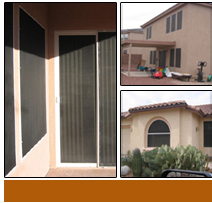 window heat and provide daytime privacy with our SunScreens!